Beautiful, deep brown wood look. 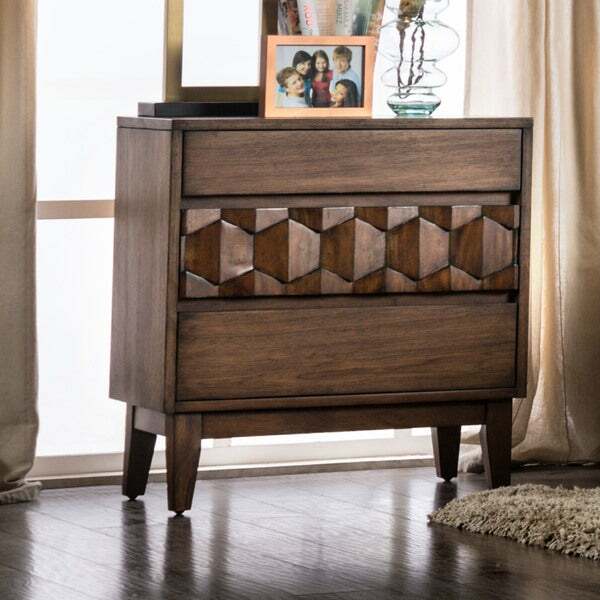 Very attractive pattern on the middle drawer. Feels like a high quality piece of furniture. And comes fully assembled, just screw on the legs. Step out of the ordinary with this magnificent Furniture of America Curtiz Contemporary Laser Cut Wood Nightstand. A layered, laser cut hexagon pattern takes this nightstand from routine to extraordinary. Dimensions 26.0 In. X 16.0 In. X 28.0 In. Absolutely love these nightstands. I purchased two.They arrived in excellent condition because of the great packaging and protection. They come all put together and all you have to do is attach the legs which is great! Beautiful and well made! These nightstands look more expensive than the price I paid for. Worth it! Great quality and looks great! "What material was the back made of? Same kind of chestnut wood as the sides of the nightstand? Thank you for your response in advance! Valeria"